88. The Letters of Ezra Pound to Alice Corbin Henderson. 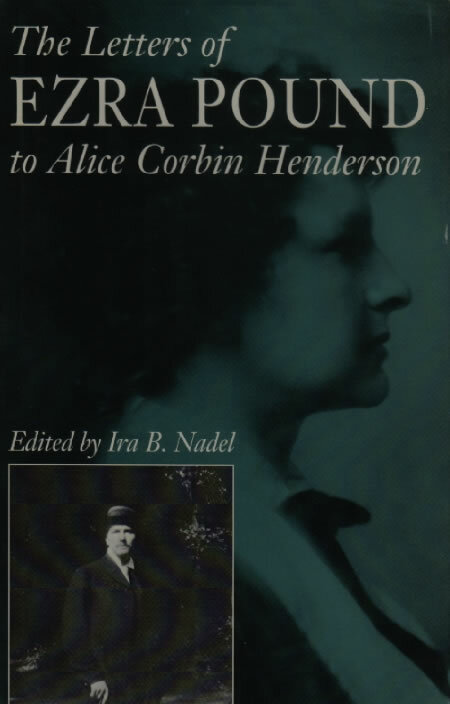 Edited by Ira B. Nadel. Austin: U of Texas P, 1993. In a letter to Harriet Monroe accompanying the earliest submission of Cantos for publication, the ‘Three Cantos’ that appeared in Poetry in 1917 (27), Pound wrote that the ‘theme’ of his long poem-in-progress would be ‘roughly the theme of [the nô play] “Takasago,” which story [he hoped] to incorporate more explicitly in a later part of the poem’ (70c). Strangely, however, Takasago did not appear among the plays from the nô that Pound published from 1914 to 1917. Among the Pound-Fenollosa papers anonymously donated to Princeton University in 1991 (90b) was a seven-page typescript of Takasago corrected by Pound, but it was not until publication of this correspondence between Pound and Henderson, Associate Editor of Poetry, that the story of his version of the play came to light (see b-d). The originals of most of these letters and many others from the Pound-Henderson correspondence are in the Harry Ransom Humanities Research Center at the University of Texas at Austin. In addition to material noted, other letters refer to the publication history of particular nô plays and other materials from the Fenollosa manuscripts, and to Pound’s relation with Aiken, Aldington, Bynner, Craig, Eliot, Ficke, Fletcher, Flint, Lowell, and Yeats (see index). a. To Henderson, 27 January 1914. Pound writes that he ‘shall send one of old Fenollosa’s Japanese plays’ instead of ‘anything of [his] own’ for the March or April Poetry, and notes that Yeats, whose work was scheduled to appear in April, would ‘like it for company’ because he is ‘very keen on the stuff’. The ‘Nôh plays of Fenollosa’s’ are ‘a definite find’, Pound adds, for though ‘the books and translations hitherto printed give nothing, or next to nothing of a notion’ of the form, it represents ‘a new beauty as worth discovering as was Chinese art a few decades ago’. Pound’s version of Nishikigi (8) appeared in Poetry in May. The letter also refers to Noguchi, who has ‘sent [Pound] one or two bad jobs’ that he will return. ‘If he has anything worse’, Pound adds, ‘it may as well come here for rejection’. b. To Henderson, 7 July 1915. A letter accompanying Pound’s submission of Takasago (88d), ChÔRyÔ (24b) and GenjÔ (24c) to Poetry. Takasago ‘is so full of poetry that Harriet [Monroe] might like it’, Pound writes, though he doesn’t want to ‘hog all the space in the magazine’, and so if Monroe does not want to print the work he hopes that Henderson might forward it to Drama. This she apparently did not do, and Pound’s versions of ChÔRyÔ and GenjÔ did not see print until publication of ‘Noh’ in 1916 (24), Takasago until this volume in 1993. Nadel speculates plausibly that the former plays appeared in ‘Noh’ while TakasaGo did not because Pound had maintained copies of the former manuscripts but not the latter (see 198). c. Introduction to Takasago. This brief introduction, along with the play itself part of an enclosure accompanying the letter of 7 July 1915, demonstrates that Pound’s failure to publish Takasago was almost certainly an oversight, resulting, as Nadel suggests (see 198), from Harriet Monroe’s failure to accept the work for Poetry, Henderson’s failure to forward the manuscript to Drama, and Pound’s failure to have retained a copy for himself (see b). Pound sees the play as ‘the very core of the “Noh”’ and its ‘structure’ as so ‘flawless’ that ‘other Noh plays are held to vary from it as from a norm’. A more important point, however, is that Pound’s description of the structure of the work lends support to critical writing by Slatin (108), Bush (145 and 161), Longenbach (183), Miyake (187, 191, and 192), Nicholls (204), and others who find in The Cantos strong reverberations from Pound’s work with the nô. No doubt because these comments have only recently been published, no critic has yet turned to them in close analysis of their relation to the methodology of The Cantos, but such an examination would be fruitful, for one may read the introduction as a tacit working through of the idea Pound had earlier intuited that in the nô one could find a way to proceed with a ‘long Imagiste poem’ (see 12 and 17f and 87). He notes that plays such as Takasago occur at the beginning and end of a full nô programme, and that ‘this very ending on the opening note is a sort of symbol of perpetuity’. The work is ‘not a dogmatic statement’, but rather ‘is, or “expresses,” a sense of past time in the present’. In words taken from Fenollosa’s notes, which Pound believes to originate with Umewaka Minoru (Ap), he summarises the point: ‘The old man and woman [in the play] say: we are symbol. In heart of young men is many dusts, old men must help allay them. When one does not sweep his dirt heaps away, he will be buried in the dust’. Pound finds the play ‘nearly intranslatable and . . . fairly incomprehensible’ until one has the ‘clue, first to the “sense of past time in the present”, second, to the symbolism of Takasago (the past age) and Sumiyoshi (the present)’, and he notes that when he speaks of the play’s ‘perfect . . . construction’ he does ‘not refer to anything like occidental “dramatic construction”’, for in Takasago ‘the various parts’ of the nô, ‘the speech telling the names, the speech saying: we have arrived, the . . . hero’s voice raised for the first time . . . the . . . “flow-along tune” and the various other divisions of Noh, are by authorities held to be each in its proper position’. This would be the article about the ‘very severe construction’ of the nô that Pound promised in his commentary to ‘The Classical Stage of Japan’ in 1915 (see 17f). d. Takasago. An ancient pine at Takasago and another at Sumiyoshi are according to legend twin pines, though separated by the sea. The play relates the story of the devotion to each other of an old man and old woman, who are found in the end to be deities associated with the pines and the places. The work closes with the revelation of their divinity and an auspicious dance in celebration of the longevity of love and of the state. Pound’s version captures much of this, and his introduction demonstrates that he understood central themes and structures, but like much of his work with the nô his presentation is fragmentary and occasionally confused, omitting, for example, the whole of the climactic ending. Miyake (191) suggests that Takasago was for Pound a central ‘vortex’ in The Cantos, and traces his conflation of the Takasago myth with the Eleusinian Mysteries, the Egyptian ‘sun boat’, and the voyage of Odysseus. See also 17f, 24b, 27, 31, 38a, 70c, 90b, 101, 115, 151, 198, 203, BL11, 36c, D3, 11, and 13.